Jonathan Rea has opened a clear advantage at the top of the World Superbike Championship after a stunning double at the Chang International Circuit in Thailand. Rea dominated both races on the Kawasaki ZX-10R, claiming a maximum 50 points haul after starting from pole position. 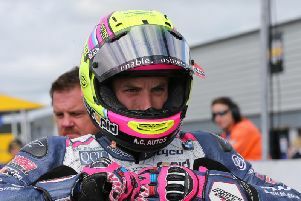 The Northern Ireland rider has now won three of the four races held so far after taking a victory and runner-up finish for his new Kawasaki team at Phillip Island in Australia in February. The 28-year-old won the opener at the first ever WSBK round in Thailand from Aprilia’s Leon Haslam and team-mate Tom Sykes, with Haslam again finishing second in race two, although Voltcom Crescent Suzuki’s Alex Lowes completed the top three places on this occasion. A jubilant Rea, who now leads Haslam by 10 points after the first two rounds, said: “For me it has been a perfect weekend with pole position and two race wins - we could not have asked for any more. The bike can always be better but at the beginning of the weekend the Ninja ZX-10R was at a really good level, my pace was really fast, the rhythm was good so we did not necessarily chase something we really could have got lost with. “Our base setting right now is good and it gives me confidence to push the boundaries and understand the bike,” he added. Motorland Aragon in Spain, which is virtually a home race for many of the Kawasaki Racing Team staff who are based in Europe, hosts the next round on April 12. Race One: 1 Jonathan Rea (GBR) Kawasaki 31 mins 33.852 secs, 2 Leon Haslam (GBR) Aprilia 31:40.181, 3 Tom Sykes (GBR) Kawasaki 31:42.035, 4 Jordi Torres (SPA) Aprilia 31:42.365, 5 Sylvain Guintoli (FRA) Honda 31:54.354, 6 Matteo Baiocco (ITA) Ducati 31:59.970, 7 Alex Lowes (GBR) Suzuki 32:00.001, 8 David Salom (SPA) Kawasaki 32:01.777. Race Two: 1 Jonathan Rea (GBR) Kawasaki 31 mins 31.173 secs, 2 Leon Haslam (GBR) Aprilia 31:36.119, 3 Alex Lowes (GBR) Suzuki 31:39.874, 4 Jordi Torres (SPA) Aprilia 31:41.801, 5 Tom Sykes (GBR) Kawasaki 31:45.499, 6 Sylvain Guintoli (FRA) Honda 31:52.233, 7 Michael van der Mark (NED) Honda 31:52.419, 8 Matteo Baiocco (ITA) Ducati 31:55.041. Championship Standings: 1 Jonathan Rea (GBR) Kawasaki 95pts, 2 Leon Haslam (GBR) Aprilia 85, 3 Tom Sykes (GBR) Kawasaki 50, 4 Sylvain Guintoli (FRA) Honda 41, 5 Jordi Torres (SPA) Aprilia 39, 6 Chaz Davies (GBR) Ducati 38, 7 Alex Lowes (GBR) Suzuki 32, 8 Matteo Baiocco (ITA) Ducati 30.